Fears have been raised over the plight of Egypt's Coptic Christian community, after a series of attacks - including the assassination of a priest and an arson attack against a church - following the ouster of Muslim Brotherhood-backed President, Mohammed Morsi. According to Al Masri al-Youm, 39 year-old Mena Aboud Sharoben was gunned down in the coastal city of Arish on Saturday, by unknown gunmen riding a motorcycle. Sharoben was a local Coptic priest, and his murder was one of several attacks by suspected Islamist terrorists over the past few days, who also targeted at least three military checkpoints and El Arish Internation Airport in one of Egypt's most lawless regions. Those attacks prompted a senior Egyptian military official to announce an impending major military operation in the Sinai Desert, aimed at rooting-out Islamist insurgents, who have also targeted oil-pipelines and police installations. The report by Al Masri al-Youm further cited the Maspero Youth Union as condemning what they described as "Muslim Brotherhood attacks on churches." According to the statement, "The president's supporters attacked [the] churches in Luxor, Qena, Minya, Towa, Sharm el-Sheikh and Marsa Matrouh. We say to them, tear down all the churches, it is not going to stop us from rebuilding Egypt... We will use the stones of our churches to build our homeland." On Friday, four Copts and one Muslim were killed in sectarian clashes in the village of Naga Hassan, during which 23 Christian-owned homes were set on fire, according to Egypt Independent - though in that case it was unclear whether the clashes were the result of a sectarian or personal dispute. Coptic Christians are an indigenous community which makes up around 10% of Egypt's population, and which has long complained of systematic discrimination and violent attacks by the authorities and Islamist terrorists respectively. 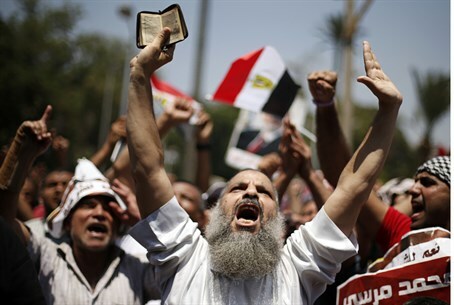 The Coptic leader, Pope Tawadros II, was fiercely criticized by the Muslim Brotherhood after coming out in support of the military's decision to oust President Mohammed Morsi. Apart from the wider security implications of escalating lawlessness and spiraling violence between secular and Islamist forces, the attacks raise concerns for the country's Coptic Christian community, which has previously been on the receiving end of violence by Islamist extremists. Coptic groups fear that their community could be scapegoated by Islamists bitter at Morsi's removal by the secular military establishment. But the attacks also compound growing concerns over the plight of the Middle East's various Christian sects, as communities from Iran, Iraq, Syria and elsewhere face mounting threats from Islamists both in government and the opposition. A report last year by Civitas, a British think-tank, warned that Christianity in the Middle East was facing "extinction" due to mounting attacks and persecution. This latest round of attacks will do little to assuage those fears.